These 40 Minute Hamburger Buns are perfect to pair with your favorite burger recipe! Easy, and made in under an hour! I have always had a hard time with bread recipes. There are so many components that need to be just right in order for your dough to rise and bake properly. THIS recipe is no-fail! So simple that even bread novices like myself can make them with great success! Did I mention the recipe comes together in under one hour? Like this recipe? You will love my Breakfast Burger, Cheesy Stuffed Burgers, and Jalapeno Popper Burgers! This is the EASIEST recipe you will ever make and totally worth the little work that goes into it. We are ditching our store bought buns for these in my home and you will want to too! There is nothing quite like fresh baked bread right out of the oven to put the finishing touches on your meal. If you are anything like me you will probably want to brush a little melted butter onto the buns before they go into the oven. Adds just a touch of extra yum and helps you get a nice golden brown. 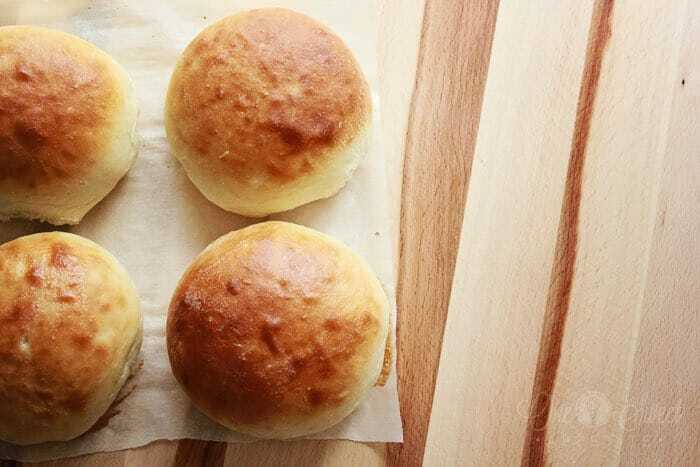 What kind of flour should you use for homemade hamburger buns? Great question. While there are many recipes out there that use a wide variety of flours, this recipe calls for regular all-purpose flour. Can I use instant yeast in place of active yeast? I have never tried this. However, I have had readers use them interchangeably with great success! How can I get golden brown tops on my hamburger buns? Whisking together 1 egg white with 2 teaspoons of water and brushing the tops before baking will help you achieve the golden brown top. You can also use melted butter. 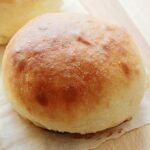 Easy hamburger buns ready in under 1 hour! Combine the yeast, water, oil, and sugar in a large bowl. Gently mix and allow to sit for 5 minutes. Stir in the salt, egg, and enough flour to form a soft dough. Turn out onto a floured work surface and gently knead in additional flour until your dough is no longer sticky. Divide into six equal pieces and form round balls. Place on a parchment covered tray and cover with a clean towel. Allow to sit for ten minutes while you preheat the oven to 425 degrees. Bake for 10-12 minutes, or until a nice golden brown. I’ve always wanted to try this. Pinned! They look great! Nice & proofed, not flat & dense looking at all. These look delicious! And your new look on your site is awesome! Love it! thanks! It’s still a work in progress. Need to make the logo bigger and add some splashes of color. Ashlee has been helping me with the coding. She’s amazing! Wow, these look yummy! I’ve tried making hamburger buns once but they were super dense, so I’ll have to give these a try! 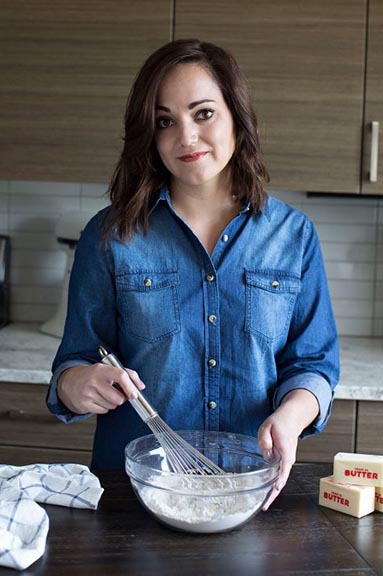 And my favorite bread recipes ….. I love my cinnamon swirl bread, and if you don’t want the cinnamon it makes a great loaf of white bread. Good luck! Our little family is super picky about our buns! haha. store bought ones are no bueno sometimes. Thanks for sharing. can’t wait to try! Do you think wheat flour would work the same way? I don’t wanna mess them up, either!! I’m a huge fan of King Arthur white whole wheat flour. I substitute all of the time and plan on doing that next time with these. Love it!!! You’ve inspired me to make my own next time. Wow, 40 minutes and you end up with these delicious hamburger buns! Sounds like a plan to me! WOW. My mouth is watering. YUM! Thanks for sharing – can’t wait to try! I haven’t tried it, but I’m sure you can! Love a simple recipe for rolls, a bit of caution when proofing the yeast make sure your water is warm and not hot, around 105-110 F, any hotter and you can kill the yeast. These rolls would also be great sprinkled with seeds or how about caraway & coarse salt like Buffalo’s Weck rolls! Tested this recipe out today. We doubled it and it came out great! Will be saving for sure! These like many breads that have such quick preparation time are too dense! They are just like a dense roll not a hamburger bun. My yeast proofed and was nice and foamy but a 10 minute rise time is not enough. Sorry. I have to agree. I made them and they were REALLY dense. I am going to try them again but I’m going to proof them and let the raise twice. They tasted really, really good, so I really want this recipe to work for me. Raising twice does lighten the buns. We prefer a thicker hamburger bun and liked the dense flavor, but my parents enjoy this recipe raised twice. We made this recipe last night and loved how simple it was! It does have a thick roll consistency but we found that we like it a little better then the store bought hamburger buns! Thanks so much for the recipe! I made these tonight for dinner. I let them rise for about 35-40 minutes and they were perfect. You don’t want them too fluffy and light because it needs to hold up with the meat. BUT, these were perfect. In fact, I could make 12 next time if I let them rise the same amount of time. Thanks again for the recipe. These will be eaten in our house for a while!!! Is it really 2 tablespoons or 2 teaspoons of active yeast? two tablespoons. I’ll update to post to make it more clear. WOW! These are awesome. I have VERY hit and miss results with bread, too, and these came out flawlessly. I let mine rise for 20 minutes, just to add a bit of lightness. Can’t wait for chicken burgers tonight! I made these and they were wonderful ! I will try and making in my bread machine on the dough cycle and see if the outcome changes. Looking forward to buttering these and grilling these buns as well as the burgers tonight for dinner ! So easy ! Thanks ! I have a love hate relationship with these buns. I hate these buns because my mom is constantly begging me to make them but we love these buns because they are amazing and so fluffy! We had them with sloppy joes one night but the other time I just made them smaller for a dinner bun. One thing I do differently is let the dough rise longer for each step but that’s only because I’m not needing these in a rush. Thank you for this recipe!! This is one of my favorite comments! I’m glad you liked them! Is that regular yeast or rapid yeast? These turned out good! We liked the taste. I brushed egg white on top and sprinkled on sesame seeds. I suggest trying to make 10 buns instead of 6. They were HUGE lol. These were delicious! I got 6 buns (we like our burger patty larger, but thinner). They rose upward but stayed roughly the same diameter, so you can easily make them whatever size you like. I did let them rise longer than 10 minutes, maybe more like 20-30, I didn’t really time it… They didn’t seem sense to us at all, but I guess that’s a matter of taste. I also lowered the oven temp a little because my oven runs hot and I wanted to give the dough time to rise a little more before the tops browned. Anyway, super easy and delicious — we may never but hamburger buns again! These are terrible. The fact that these comments are full of people who haven’t even tried the recipe is incredibly frustrating. The buns turned out incredibly dense, and even tho I heated the oven to slightly above 400 and decreased the amount of time, the outsides started to burn but the insides were still raw. This is a terrible recipe. I don’t find these terrible at all. In fact, I have made these multiple times since finding the recipe. Today I tripled the recipe for a dinner I’m going to with friends. My kids all enjoy them, as do my husband and I and we can’t wait to hear our friends reaction to a homemade bun. Im glad this recipe was shared. I made these last night and let them rise for 1 hour. I divided the dough to make 12 buns and with the rising time at one hour they were more than large enough! I couldn’t imagine how huge they would be if you only made 6. I also brushed the tops with melted butter to make them golden on top. Everyone loved them and I will definitely make them again. Thanks for taking the time to comment, Brianna! It’s been a while since I’ve made this recipe. I’ll give it a try and divide the dough into 12 next time! Thanks for the tip. I made these last night and my family loved them! Thank you! I’m not sure why some people thought this was a bad recipe. I made as directed except divided the dough into 12 instead of 6. I forgot to set a timer and think mine sat out for a little over an hour. Turned out great. Maybe people who had trouble had a colder climate or higher elevation? Thanks for the recipe. Thank you for taking the time to comment. I’m glad you liked the recipe! First time making hamb buns they were DENSE @ 10 min rise. Before making today I read all your comments and let rise 45 min. I have 6 HUGE Kaiser rolls but they are sooooo tasty. Next time I’ll divide into 10 buns. Thank you for all your hints because this is a keeper. So easy and NO dairy ☺ (I am allergic to the caseins in dairy.) PS I used EVOO cold pressed.